If you are a realtor or a buyer, beware of septic inspections that do not look inside a home’s septic tank. If the tank is leaking, it is not usually visible just by looking at the grass over the tank. Most concrete septic tanks are installed in two sections placed on top of each other; it’s usually at the seam between these two sections where tanks leak. This seam is usually several feet below the surface of the ground, so any leaking water travels downward instead of to the surface. Septic tanks should be watertight — no liquids should be able to seep out. Even if a house has been unoccupied, what was in the septic tank when the house was vacated should still be there. Therefore, if the liquid level in the tank is low, this is a sign the tank might be leaking. 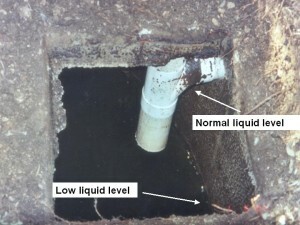 The liquid level in the septic tank is unknown, so it will also be unknown if the tank is leaking. If the liquid level is low, the absorption area cannot be tested to make sure it’s working properly. The tank has to be filled to its normal operating level, where the outlet pipe exits the tank towards the drainfield, to perform this test. If a tank is leaking and only a visual inspection is performed, the inspector is likely to have no clue. The inspector could probably run all the water he wants to and never see a problem on the surface of the ground — and since the liquid level is lower than the outlet pipe due to the leak, the inspector won’t know if there’s a problem with absorption field either. A full septic inspection is better than a visual inspection. If you are a realtor and your client is having their home inspector perform their septic inspection, be sure that the limitations of the visual inspection are disclosed. Need a full septic inspection for your home? Contact us today to schedule one. ← Do You Know What Your Aerobic Maintenance Provider Can Do for You?